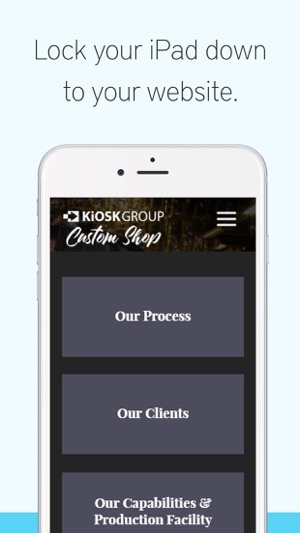 Kiosk Pro is a flexible solution for any project that makes an iPad available to visitors. As a specialized web browser, Kiosk Pro Lite can display web pages, documents or audio & video files hosted online. • Define a homepage as the starting place for the presentation. • Set an idle timer so that when a visitor walks away, the next person will have a fresh experience, starting right at the beginning. • Increase visitor turnover at your kiosk by setting a browsing time limit. • Specify what’s off limits on the web by whitelisting specific allowed domains. 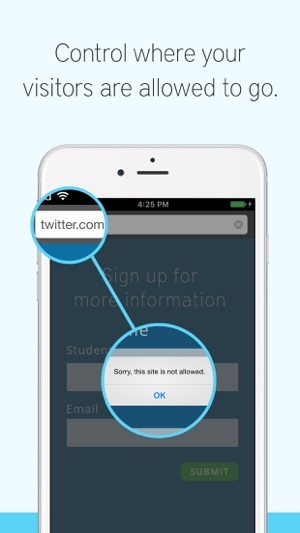 • Block access to other apps, including the native email or phone, that could otherwise be opened through links. • Disable touch interaction when used for digital signage. 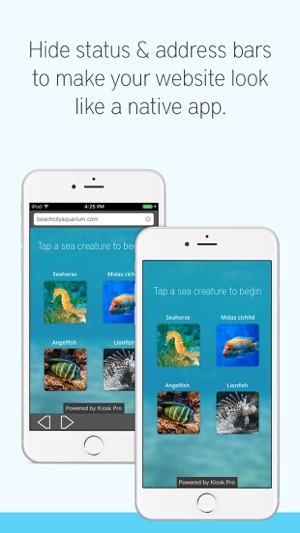 • Hide status, address, and/or navigation bars to make your content look like a native app. • Includes a ‘Powered By Kiosk Pro’ watermark at the bottom of the screen. This is removed in paid versions. Support is built right into our apps with documentation of every feature and direct access to our extensive Knowledge Base. 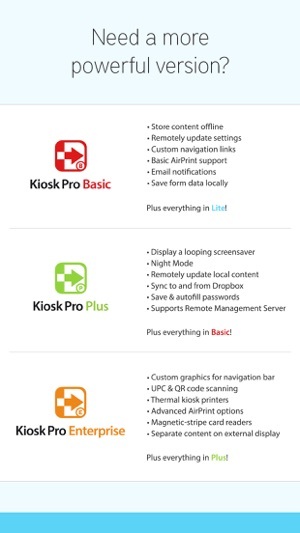 Kiosk Pro Lite is compatible with most web content, including HTML web pages, PDFs, and multimedia (including .mp4 video). While certain Powerpoint, Keynote, and Word files are also supported, they are displayed as static documents. Kiosk Pro Lite cannot display multiple tabs or pop-ups, other apps, or Flash-based content. To prevent visitors from exiting Kiosk Pro Lite, you must enable Guided Access in the iPad settings or use Apple’s Configurator app to supervise the iPad into Single App Mode. Our professional kiosk enclosures secure your iPad from theft or damage. See iPadKiosks.com for more details! We’ve put on our our warmest pair of bug stomping boots and and are splashing through some mid-February slush puddles. • Pages were not loading as expected when navigating back from a PDF using WKWebView. We needed this app for a work project. Originally the app did just what it advertised but then the iPad began acting strangely. Even with the app disabled the iPad began running extremely slow in other apps. Then the screen rotation began to malfunction, not allowing a screen rotation unless you swiped to next page of apps. We eventually removed the app and the iPad returned to normal. Buggy? 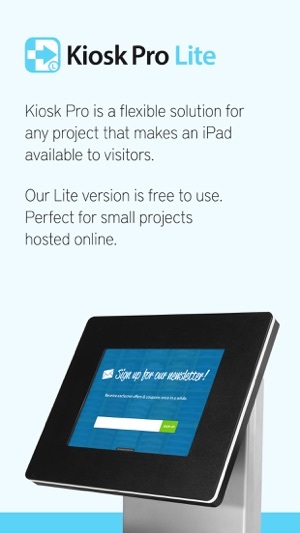 Very good, turns your ipad to a kiosk. Infact the perfect one. Just need lock settings feature and if possible logs as well.